Take the guess work out of thermal and acoustic control… All in one part number! Introducing a simple and cost-effective, universal-fit, sound deadening and thermal insulation kit. Each kit includes 25 sq. ft. of Boom Mat damping material, 27 sq.ft. of Under Carpet Lite and one 18oz. 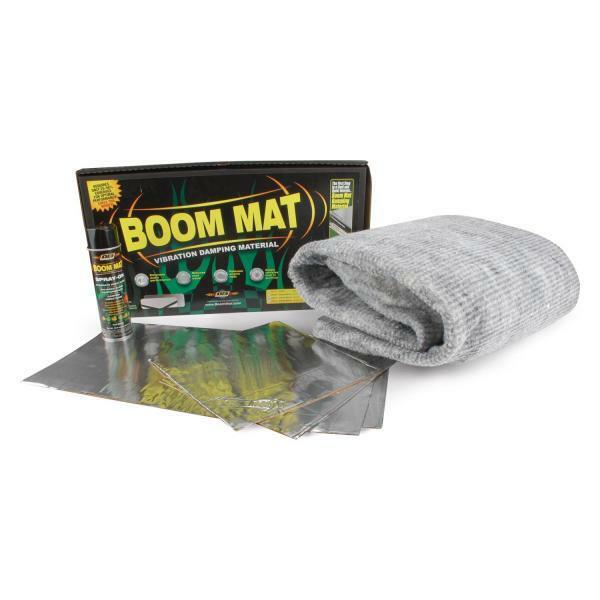 can of Boom Mat Spray-On to cover the interior of most small to medium size vehicles. STEP 1: Apply Boom Mat vibration damping material with 25-50% coverage on any flat expanses of sheet metal to remove structure-borne vibrations, squeaks & rattles. Also apply damping material to door skins for that nice solid “thud” when closing your vehicle door. STEP 2: Apply Boom Mat Spray-On to reduce the noise from structure borne vibration in those hard to reach areas such as trunk interiors, fender wells, undercarriage, body panels, rear quarters and inside door panels. STEP 3: Apply Under Carpet Lite over damping material on firewalls and floor boards to block up to 85% of heat transferred from engine, transmission and exhaust system while offering additional noise control.